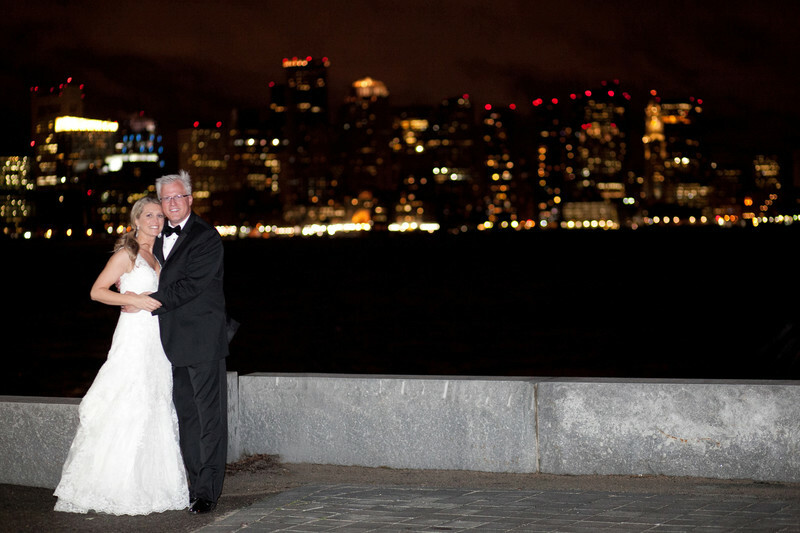 I love shooting weddings at the Boston Hyatt HarborSide with the skyline view. It's the perfect place to have a reception over looking the water. At night you have the opportunity to take photos in front of the Boston city skyline. Sarah was willing to do anything as long as it was quick!! It was really cold and windy on this Fall day. With the wind whipping we were only able to get a few shots in and then run inside. One shot that was really important to Sarah was the city skyline. At the Hyatt Harborside there is a great area outback that you can walk along the water. They have chairs and blankets too so you can sit by the fire pits and have a glass off wine. Sarah really wanted to go out there and get this shot. Located near Logan Airport this location has a spectacular view of the night sky of Boston. The cocktail hour is normally held on the lawn of the hotel and guests can mill about and enjoy the view! This airport is one that airlines put pilots up at because its close to Logan and easy in and out to the airport. Location: 101 Harborside Dr, Boston, MA 02128.